Update: the expungement provision passed and then became a model for federal legislation introduced by Congressman Earl Blumenauer. Legalizing marijuana is a lifelong passion of mine and I certainly look forward Oregon creating thousands of new jobs and generating millions of dollars in new revenue. 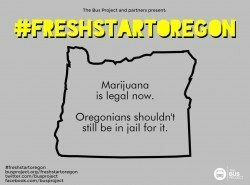 However, first and foremost, I am a civil liberties activist and I think that freedom is the foundation for marijuana legalization and I am most excited by the fact that thousands of otherwise law-abiding citizens won’t be arrested and cited in Oregon each year after the Measure 91 personal legalization provisions go into effect on July 1st. And while it is great that we are improving marijuana laws moving forward, we still need to correct the injustice done to those convicted of marijuana offenses in the past. I was ecstatic when the Bus Project contacted me and asked if New Approach Oregon would want to join forces to help pass a bill that would expunge old marijuana convictions. “If you have that on your record you have a tough time getting a house, you have a tough time getting a job, you have a tough time getting a federal grant loans,” said Aaron Brown, with Fresh Start Oregon. The group made calls to supporters asking them to call their representatives in Salem. They say it’s a long shot the bill will get passed because of how late it is in the session. “We’re ready for a new direction and we’re ready to stop letting marijuana charges – and they’re super petty and minor – continue to ruin young Oregonians’ lives,” said Brown. I am so proud of the volunteers that came out to make phone calls last night and that will continue pushing legislators to pass this common sense provision. Voters in Oregon spoke loud and clear–it is time to stop treating marijuana as a crime. It makes absolutely no sense to further hinder people’s lives for something that becomes legal in just a few weeks. If you would like to help, you still can, just head on over to the #FreshStartOregon campaign to sign up.